I can't seem to find a whole lot of information on these wheels. 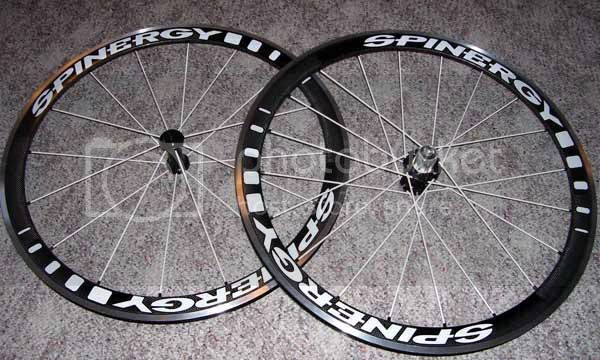 Does anyone have them who can compare them to other wheelsets? Or perhaps, does anyone have a source for test data on these wheels? I have a set and I really like them. Unfortunately I have never ridden any other deep dish wheels to compare them to though. The only downside that I know of is that they are relatively heavy. About 100 - 150 grams more than the claimed weight. The plus side is I feel that they are really fast on the flats, and believe it or not I even enjoy climbing with them. I also really like the way they soak up the small bumps. I might have expected the wheels to weigh that much after skewers and rim tape were thrown on, but a 150g difference from claim is rather significant. I'm starting to kick myself for not having picked up Ritchey Carbons (404 rims) last year for the same price... but alas, I had no money back then, and they're no longer a sponsor. The actual weight on mine, not including skewers was either 1,803 grams or 1,806 grams. That includes rim tape. So would you say that overall they're still a good choice of wheel to buy in a very sub-1k price range? I'm just getting into TT and also a few tris this year; I figured these would be a nice way to try out deep wheels since I don't know much I'll actually get into time trialing. I am still very happy with them, especially for the price. Hi LowCel, since your last posting was back in February 2007, could you post a followup review? it scares me that i just spent the last couple hours researching these wheels and now you bump this thread. Good solid wheels except I have now broken two pawl springs since late August. That being said, you have to understand that these are my training wheels with over 10,000 miles on them. I would buy another set in a heart beat. They are great wheels and like lowcel said earlier, they are good climbing wheels as well, but a little on the heavy side. Right now I am 89kg, but most of the miles can when I was around 103kg. We had some at the shop a while back. and I rode them a little. I found them super super soft not stiff at all, I thought the bearings felt terrible like gritty and they can be a ***** to true. Also if you catch a spoke on something they can kind of tear.